Planning and building SQL Server in RDS doesn’t have to scare you. 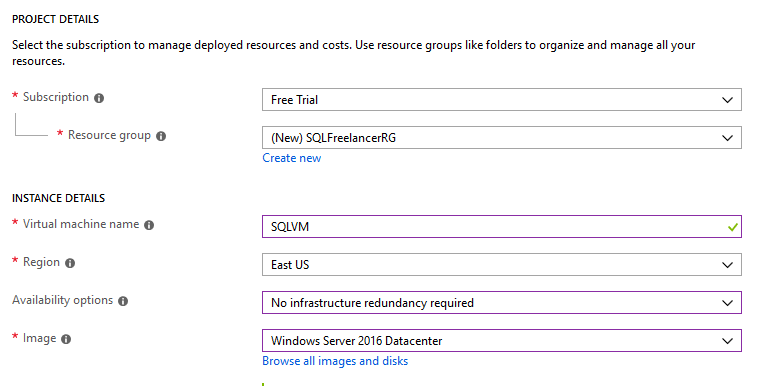 It’s actually pretty easy and in this post will go over planning a SQL Server deployment in RDS, creating SQL Server in RDS, and last but not least configuring the new instance of SQL Server. You can only have a maximum of 30 databases per instance and 16TB of storage. Once you can verify that your environment will run properly in RDS you’ll need to look at the pricing model. 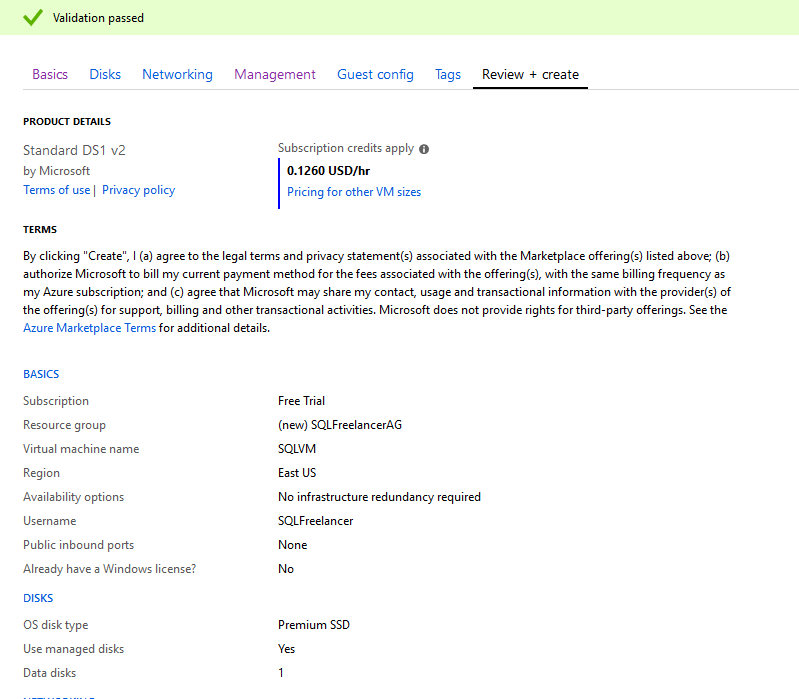 When you setup RDS for SQL Server, the software license is included. 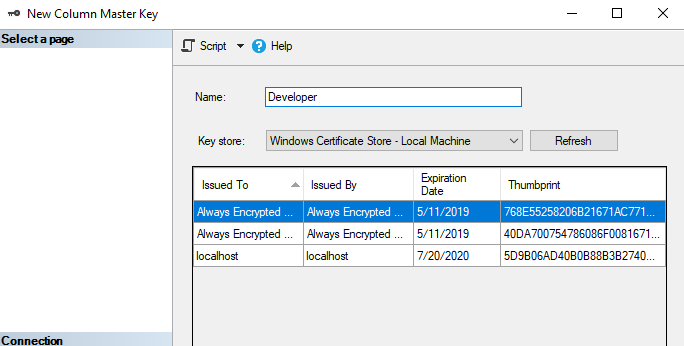 AWS used to have a program called “Bring your own license” or “BYOL”, which allowed you to use a license that was already bought from Microsoft via an agreement or other. This has been rumored to expire on June 30, 2019. The software license that is included means that you don’t need to purchase SQL Server licenses separately. 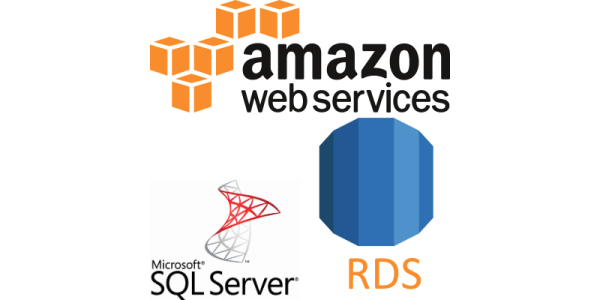 AWS holds the license for the SQL Server database software. Amazon RDS pricing includes the software license, underlying hardware resources, and Amazon RDS management capabilities. The pricing will depend on the selections such as size, edition, etc. Notice, Developer Edition is not included with RDS and Web Edition supports only public and internet-accessible webpages, websites, web applications, and web services. You can also choose from On-demand or reserved instances. On-Demand DB Instances let you pay for compute capacity by the hour your DB Instance runs with no long-term commitments. This frees you from the costs and complexities of planning, purchasing, and maintaining hardware and transforms what are commonly large fixed costs into much smaller variable costs. This is good for development environments where you can power on and off the server as it’s being used. 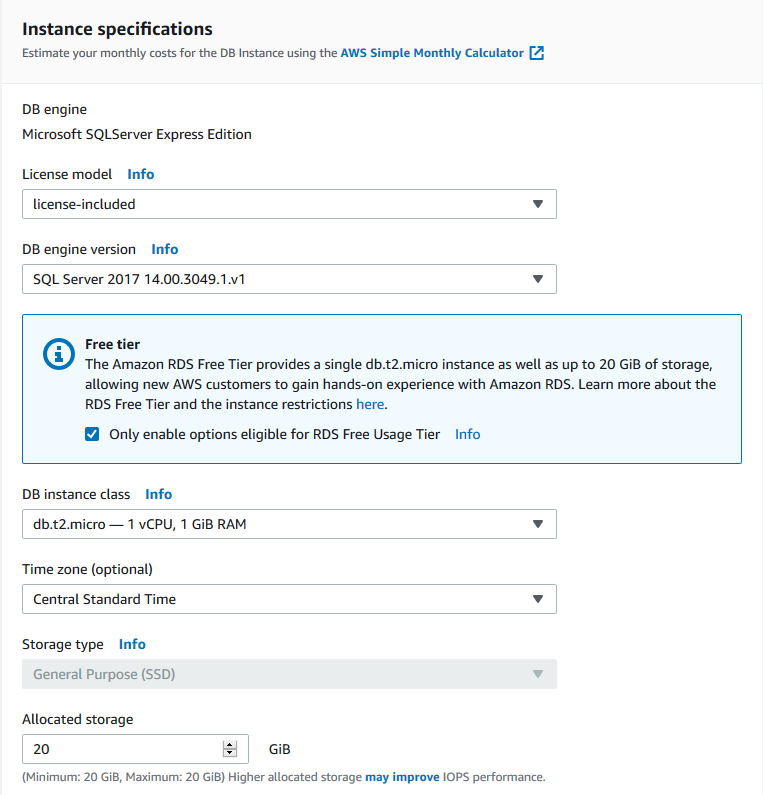 Reserved Instances give you the option to reserve a DB instance for a one or three year term and in turn receive a significant discount compared to the On-Demand Instance pricing for the DB instance. Amazon RDS provides three RI payment options — No Upfront, Partial Upfront, All Upfront — that enable you to balance the amount you pay upfront with your effective hourly price. 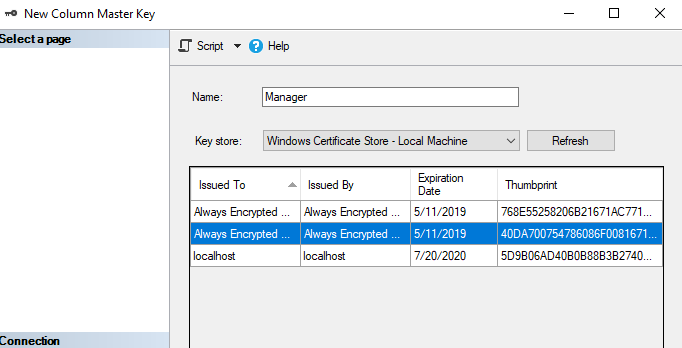 Another item to look at when planning your deployment is storage. 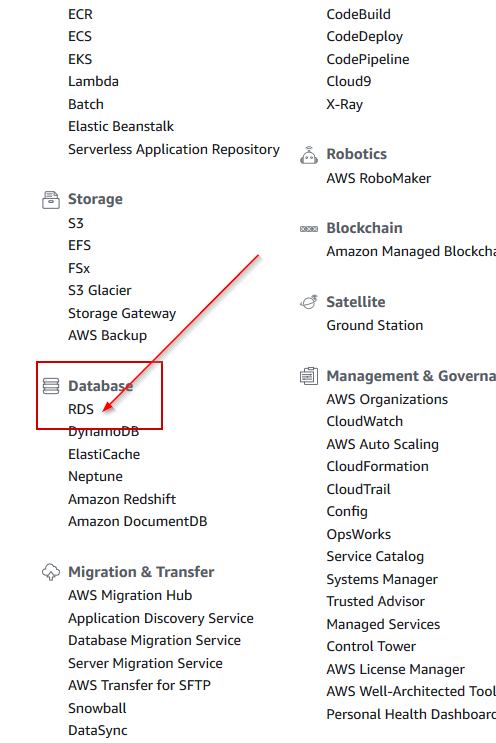 RDS uses Amazon Elastic Block Store (Amazon EBS) volumes for database and log storage. Depending on the amount of storage requested, Amazon RDS automatically stripes across multiple Amazon EBS volumes to enhance performance. General Purpose SSD – also called gp2, this storage type offers cost-effective storage that can be used for a broad range of different workloads. These volumes deliver single-digit millisecond latencies and the ability to burst to 3,000 IOPS for extended periods of time. I would recommend putting small to medium sized databases on this type. Provisioned IOPS – This storage type is designed for I/O intensive workloads, particularly database workloads that require low I/O latency and consistent throughput. This is also built on SSD and targeted for IO intensive, high performance databases. Cost wise, this is the highest of the three storage types. Magnetic – This storage type is mostly used for backward compatibility. Amazon recommends using gp2 or Provisioned IOPS for any new builds. This is ideal for test and dev environments when performance isn’t a concern. This is the cheapest of the three storage types. One more item to consider when planning the deployment is network connectivity. 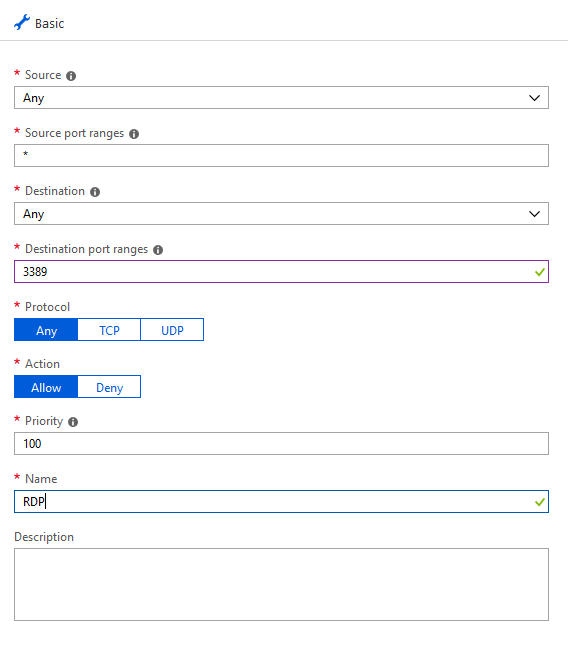 Applications will more than likely need to connect to your RDS environment so there are a few import concepts to look at it. 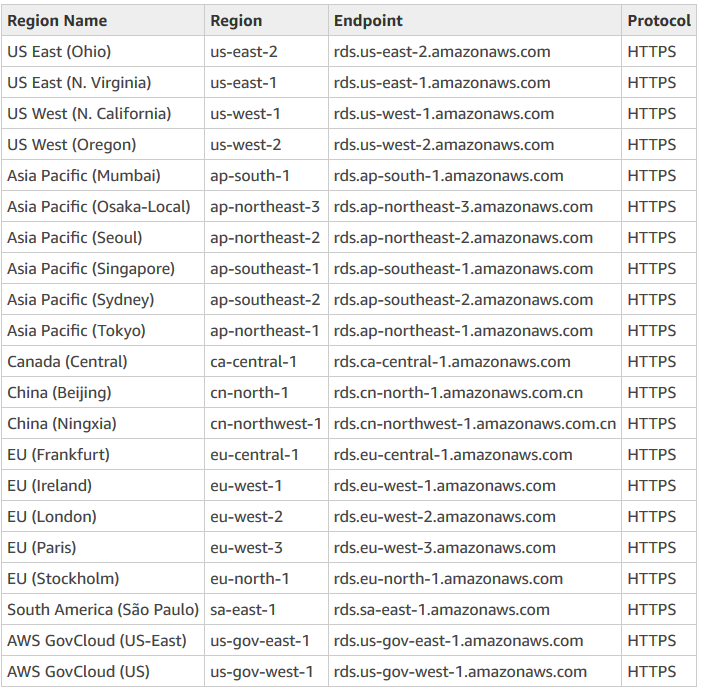 Availability Zones – this is simply a data center in an AWS region. 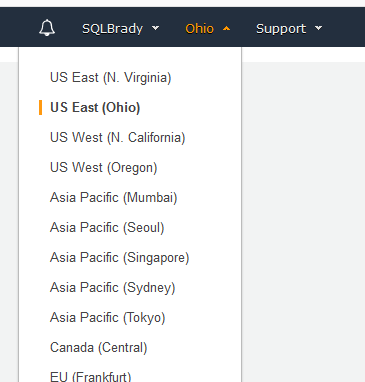 The following AWS regions exist. 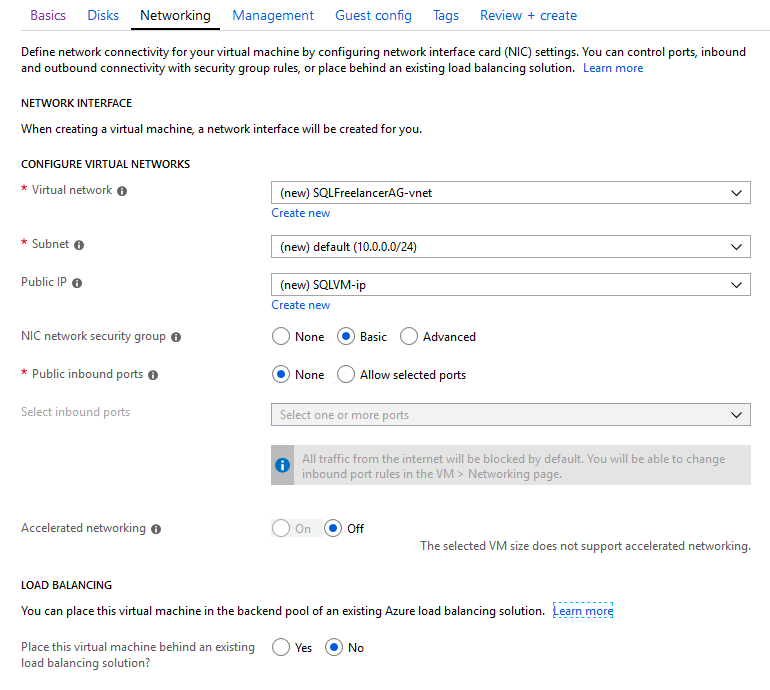 Virtual Private Cloud – also called VPC, this is an isolated virtual network that can span multiple Availability Zones. It’s used to group different types of resources to the network that need to talk to each other. Now that we’ve outlined some of the deployment planning tasks, let’s build an instance through the AWS console. 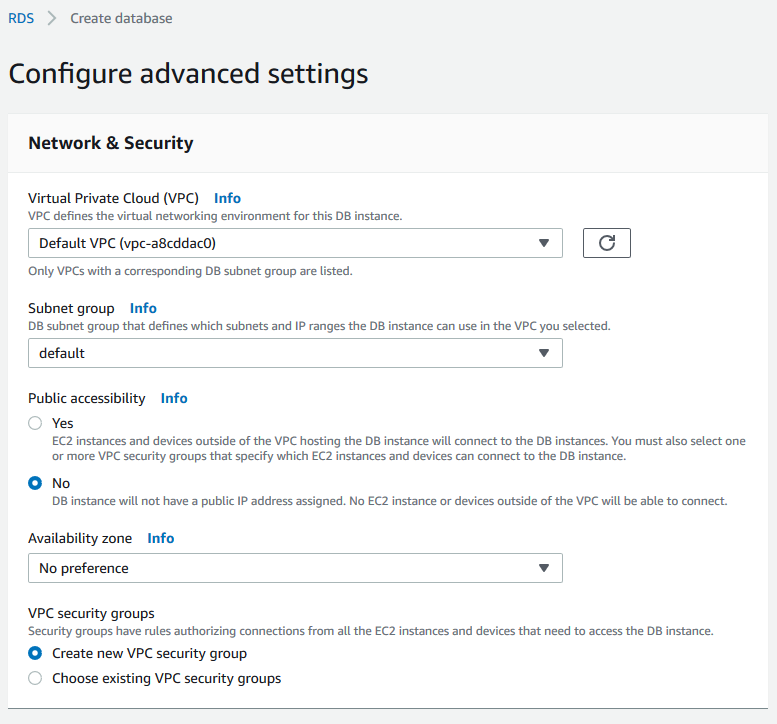 On the Advanced Settings page we’ll configure Network and Security, Windows Authentication, Database Options such as port number, Encryption (where available), Backup retention, Monitoring, Performance Insights, Maintenance options, and Deletion protection. I’m going to choose all the defaults for this post, but this is a page where you want to make sure you choose what is best for your environment. 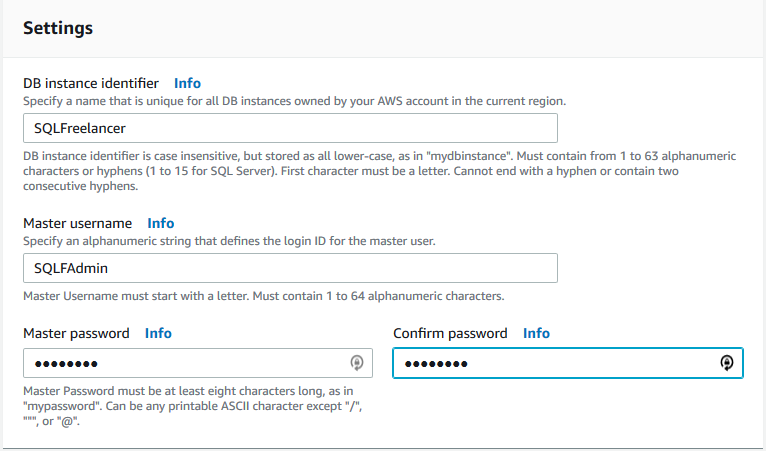 Once you are finished on the Advanced Settings page, click Create Database. 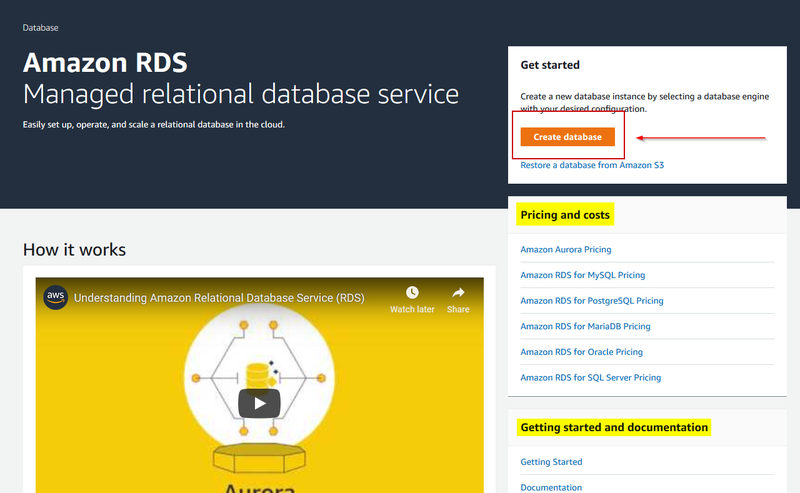 As defined by Amazon, Amazon Relational Database Service (Amazon RDS) makes it easy to set up, operate, and scale a relational database in the cloud. It provides cost-efficient and resizable capacity while automating time-consuming administration tasks such as hardware provisioning, database setup, patching and backups. It frees you to focus on your applications so you can give them the fast performance, high availability, security and compatibility they need. RDS is also referred to as a Database as a Service (DbaaS) or Platform as a Service (PaaS) not to be confused with Infrastructure as a Service (IaaS) which we’ll discuss in the next paragraph. DbaaS takes care of backups, High Availability, Patching, OS, underlying hardware Iaas will only take care of the VM host layer and it’s hardware. You will need to manage patching, HA, security, etc. This is essentially like an on premise server. Backups: RDS will continuously take backups and allow point in time restore capabilities. We no longer have to worry about disk space or archiving backups to another location. HA: RDS can automatically setup mirroring to another data center which allows for redundancy of databases. Patching: RDS will automatically patch your SQL Server based on a maintenance window defined by you. Add Resources such as CPU/Memory: RDS can increase CPU or Memory on demand as opposed to managing an on premise where the server might need downtime and you would have to orchestrate the change with Server Administrators. 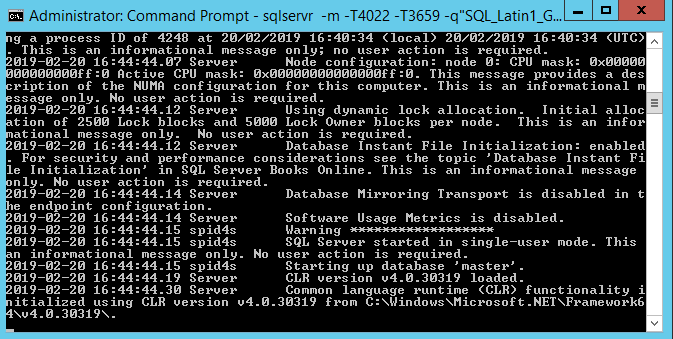 Upgrade: With a push of a button you can automatically upgrade SQL Server and easily roll back if necessary. 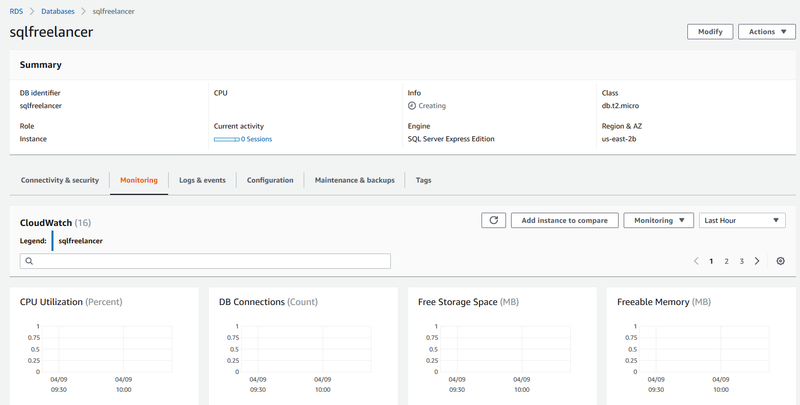 Monitoring: Instead of buying a third party monitoring tool and running through the setup RDS provides a service called CloudWatch that can easily tap into SQL Server and alert when things go wrong. Write queries, tune queries, test queries: RDS has no knowledge about the data in each DB. Only a DBA knows the application and business processes to write and tune queries. 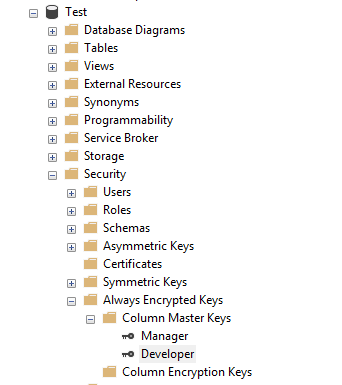 Manage DB security, change control, configuration settings: Only a DBA familiar with all of the procedures of his/her company can really make sure the environment is secure, that all changes are being documented, and that a specific configuration applies to what the databases are supposed to do. Tune indexes or maintenance: Again, only the DBA knows what databases might need indexes or aren’t using specific indexes. You also know when to run maintenance procedures. Now that we’ve discussed some of the pros and cons, why do businesses use DbaaS? The speed of provisioning increases business value because instead of waiting weeks to bring a server online including purchasing software, servers, licenses, managing resources, etc. 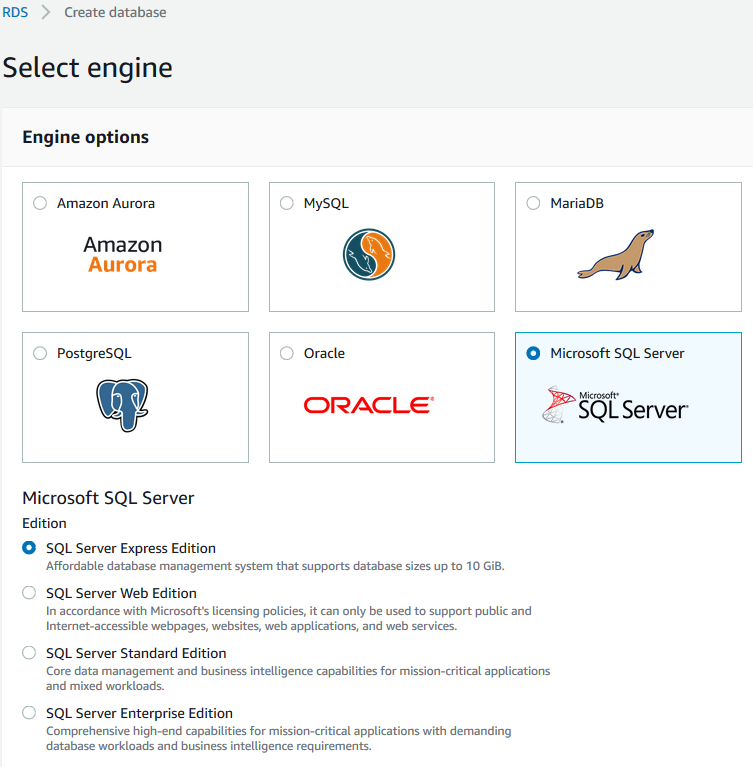 you can click a few buttons in the Amazon console and have a fresh SQL Server online in a matter of minutes. The automation of regular tasks means there’s less possibility of human mistake and less hours spent by the admins patching and managing certain parts of the servers, which means no more late nights. Employees can now spend more time query tuning, deploying new functionality, and making sure the performance is the best. All of this leads to increased revenue for the business. 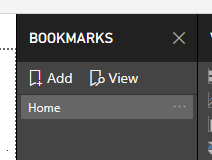 In this post we’ll quickly go over how to create a few bookmarks and view them as a slideshow if you will. Remember, bookmarks are used to capture the current view of the report so I’m going to use the default view where I’m showing all data and I’m going to name the bookmark “Home”. 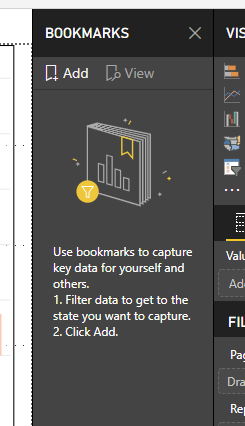 Make sure all filters are selected to show all data and click Add under the bookmark pane. 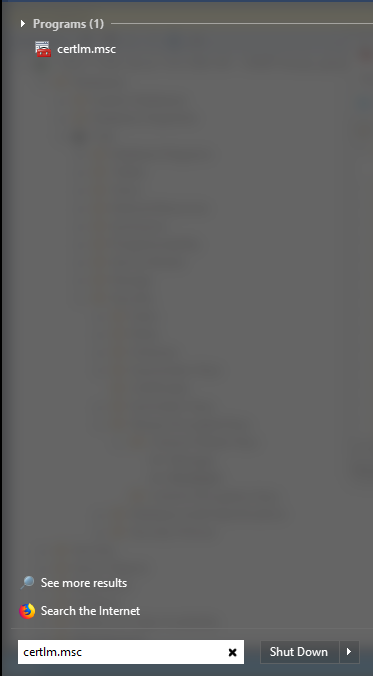 This will create a new Bookmark, named Bookmark 1. Click the ellipsis and select rename to rename the bookmark appropriately. Next, I like North Carolina, so I’m going to go to my Team Filter and choose North Carolina which will show me data for only this team. 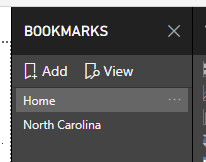 In my bookmark pane, I’m going to click Add again and rename to North Carolina. 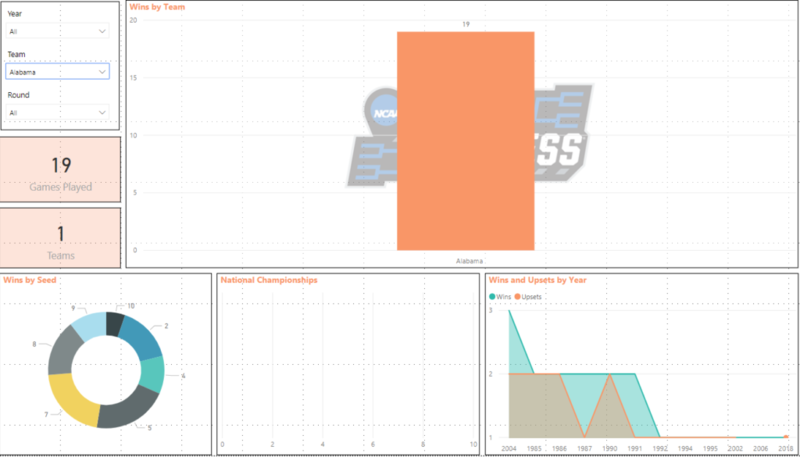 Next, I want to view data on North Carolina from 2000 to present so I’ll change the Year Filter. 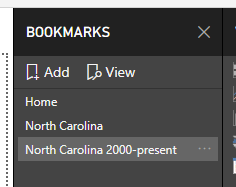 In my bookmark pane, I’m going to click Add again and rename to North Carolina 2000-present. Now, if I click on any of bookmarks, it will take me to the data that was saved for each. This is a great way to present data in a meeting/conference so you don’t have to manually change the filters during the engagement. 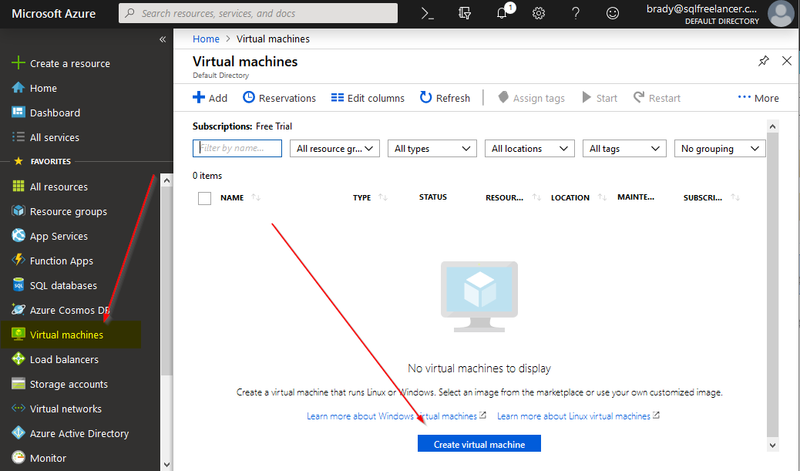 I wrote a post a few weeks about creating an Azure Windows VM so wanted to follow up with a post about creating an AWS Windows VM to compare both platforms. I like Azure and AWS so I’m not going to throw either one under the bus. Both are great and easy to use. Let’s create an AWS (EC2) Windows VM. 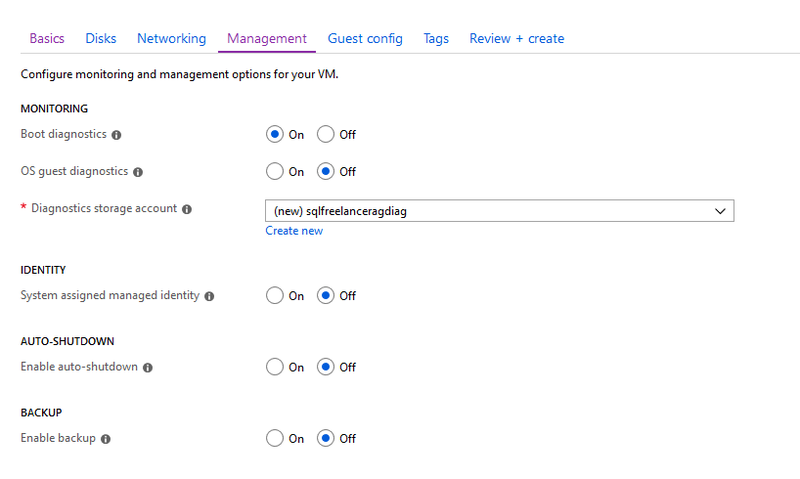 Once I’ve selected my instance type I’ll click Next:Configure Instance Details. Step 3: Configure Instance Details is where we’ll configure our new server. Let’s go down the list. Number of Instances – This is the number of servers you want to create. If you need 5 of the same servers, this makes it easy. 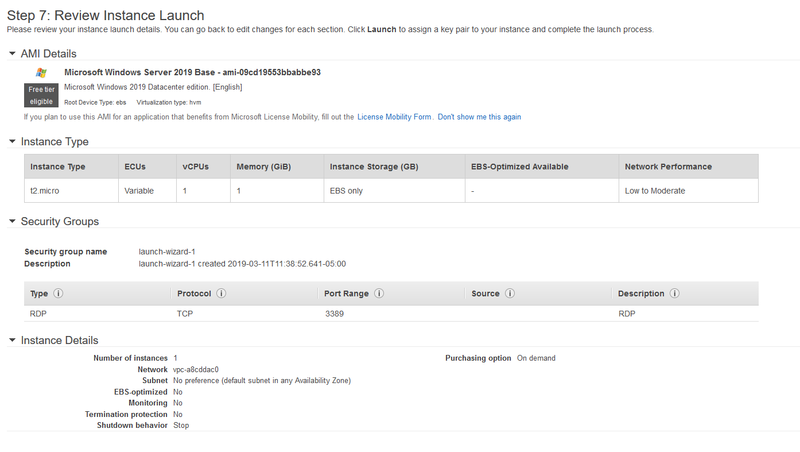 Spot Instances – A Spot Instance is an unused EC2 instance that is available for less than the On-Demand price. Because Spot Instances enable you to request unused EC2 instances at steep discounts, you can lower your Amazon EC2 costs significantly. The hourly price for a Spot Instance is called a Spot price. The Spot price of each instance type in each Availability Zone is set by Amazon EC2, and adjusted gradually based on the long-term supply of and demand for Spot Instances. Your Spot Instance runs whenever capacity is available and the maximum price per hour for your request exceeds the Spot price. Subnet: the range of IP addresses in your VPC that can be used to isolate different EC2 resources from each other or the internet. Auto-assign Public IP – requests a public IP address from Amazon’s public IP address pool, to make the server reachable from the internet. Capacity Reservations – enables you to reserve capacity for your Amazon EC2 instances in a specific Availability Zone for any duration. This gives you the ability to create and manage capacity reservations independently from the billing discounts offered by Reserved Instances (RI). By creating Capacity Reservations, you ensure that you always have access to EC2 capacity when you need it, for as long as you need it. Domain join directory – enables you to join a domain that you’ve already created. IAM role – automatically deploys AWS credentials to resources that assume it. Shutdown behavior – specifies what happens when an OS level shutdown is performed. Enabled termination protection – You can protect instances from being accidentally terminated. Once enabled, you won’t be able to terminate the instance until this option has been disabled. 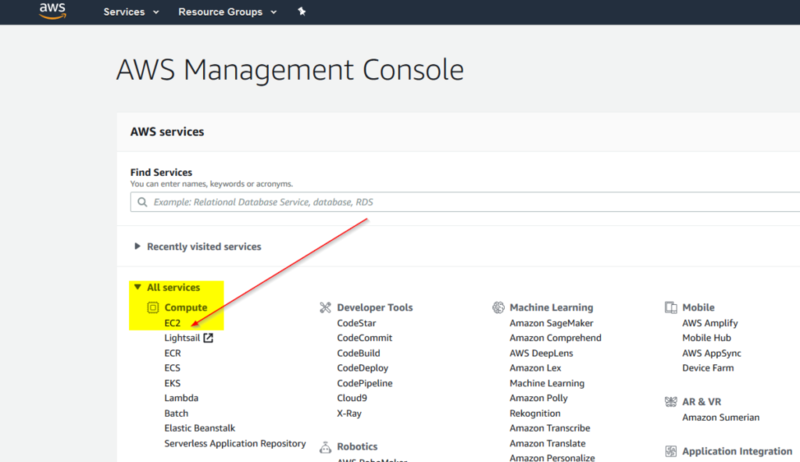 Monitoring – Monitor the instance with Amazon CloudWatch. 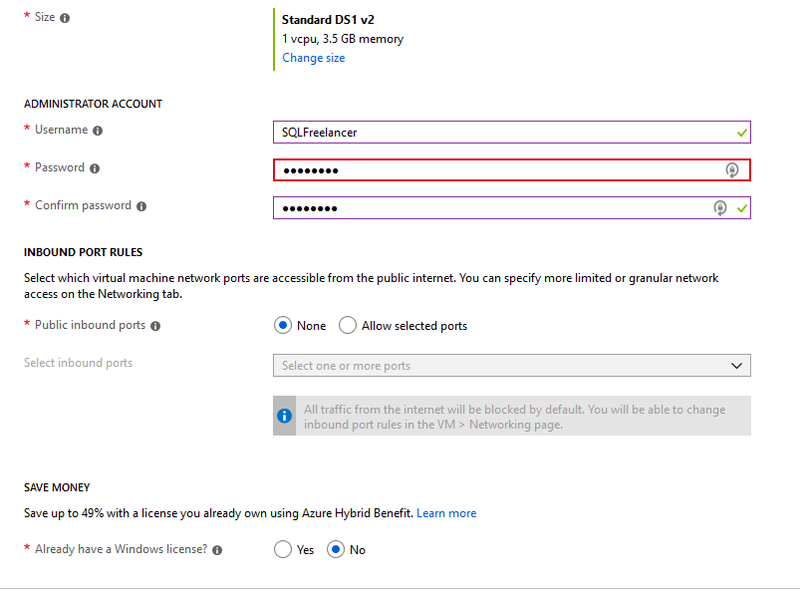 Tenancy – You can select to run your server on a shared server or a dedicated server. Elastic Graphics – Enables graphic acceleration. For this post I’ll use defaults and click Next. Step 4 is Add Storage. Selecting default and clicking next. Next…and last page is a summary of the options selected. To finish configuring the instance, click Launch. 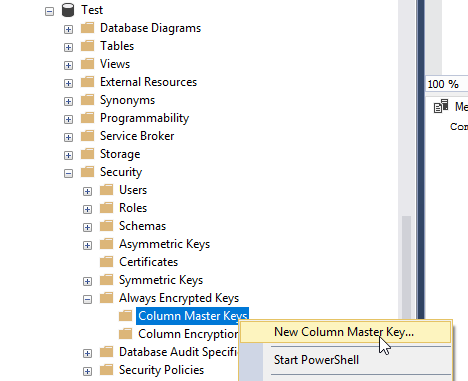 After clicking launch, you will see a popup where you can create or use an existing key pair. 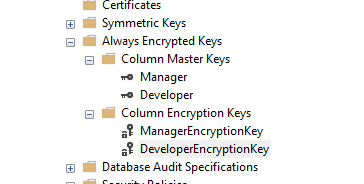 A key pair consists of a public key that AWS stores, and a private key file that you store. Together, they allow you to connect to your instance securely. 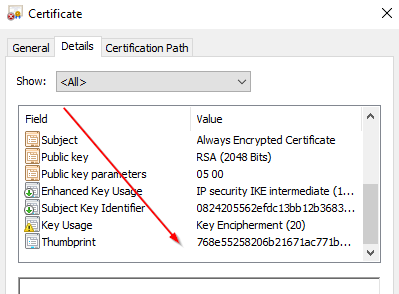 For Windows AMIs, the private key file is required to obtain the password used to log into your instance. 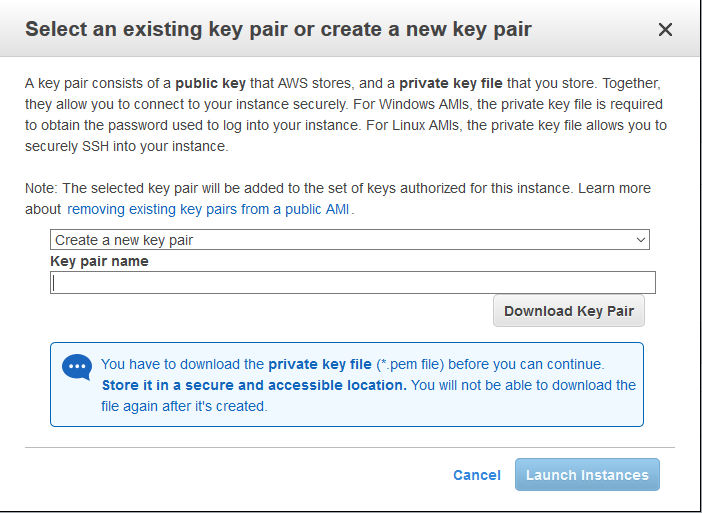 For Linux AMIs, the private key file allows you to securely SSH into your instance. To create my dynamic title, I’ll first need to create a measure table that has my Order Date data. In this case, that table is FactInternetSales and the column is OrderDate. Let’s walk through this real quick. The first line (Order Date Title = “Sales For “ &) is basically naming the measure and adding the beginning text for the title. The second line (MIN ( FactInternetSales[OrderDate] ) & “ to “) is finding the minimum order date from FactInternetSales.OrderDate and then adding the “to” text. The last line (MAX ( FactInternetSales[OrderDate] ) is finding the maximum order date from FactInternetSales.OrderDate. This one was pretty easy. Once I’ve typed my DAX, hit the checkmark to make sure there are no errors and the click off screen. Our measure has been created! Let’s go back and find it under the FactInternetSales fields pane. Next, let’s click on the Card Visualization and move and size it appropriately to fit in our title space. While the card is highlighted, click on the new measure from the Fields pane and it will populate the card with the measure we created. The only thing left to do is format the title and we’re all set! If we change the Order Date Slicer, you’ll notice the title changes with the date. See live example at the beginning of this post. This post is just going to show off my dashboard. 😊 See live example above. I’m a huge sports fan and the best time of the year happens to fall in March. Besides my birthday being in March, it’s also March Madness. Hours and hours of basketball. I could of used AdventureWorks for my dataset, but I wanted to use something I’m interested in. I found some data containing every NCAA tournament game result since 1985 (when the tournament was expanded to the 64 team bracket). 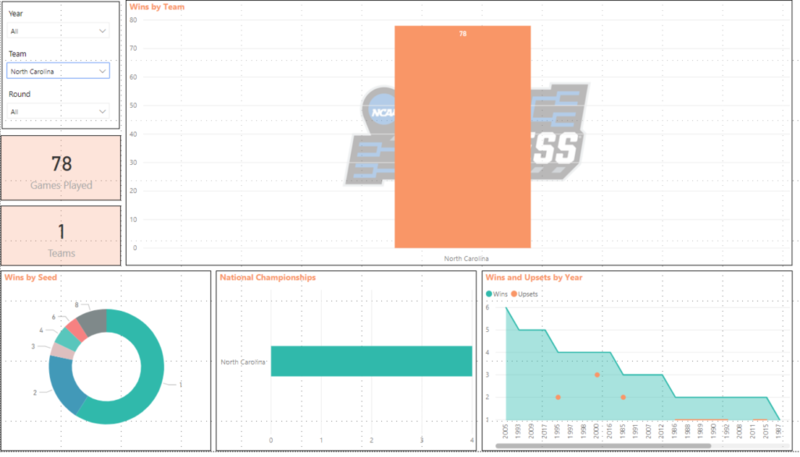 The dataset contains the year, round (1-6), seed of the teams (1-16), region (1-4) and the scores. Perfect. 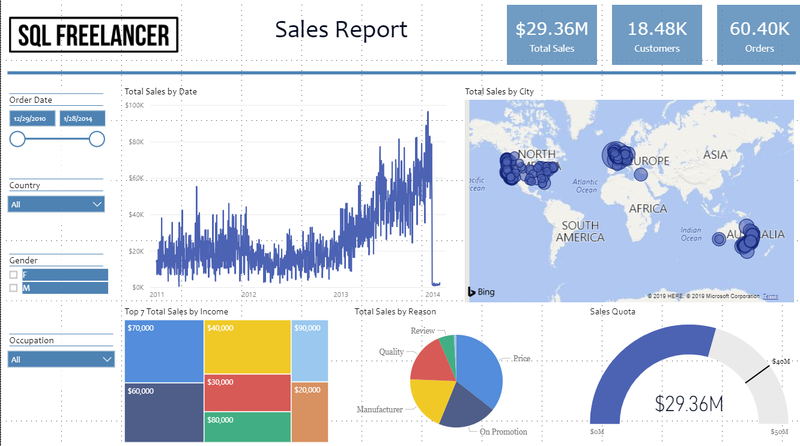 Let’s use this to create a dashboard. 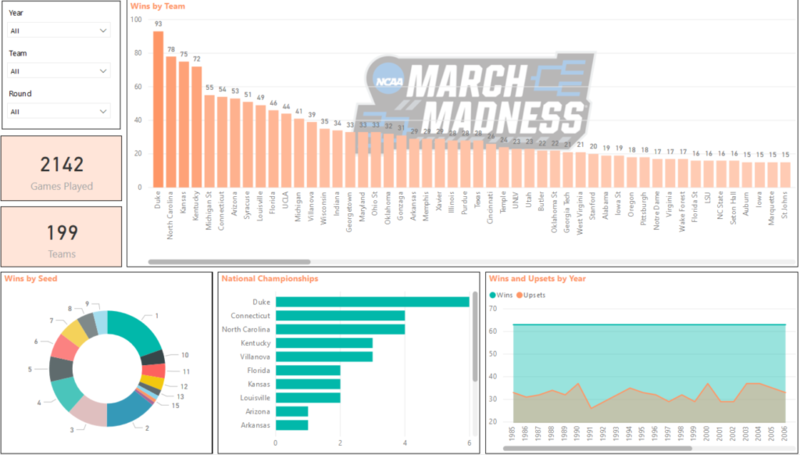 You can see Wins By Team (Duke with 93, North Carolina with 78, etc), Wins by Seed, National Championships, and Upsets vs Wins by Year. You can also see that a total of 2142 games have been played with 199 different teams in the tournament. You can see that Duke won the National Championship from the National Championships visualization. 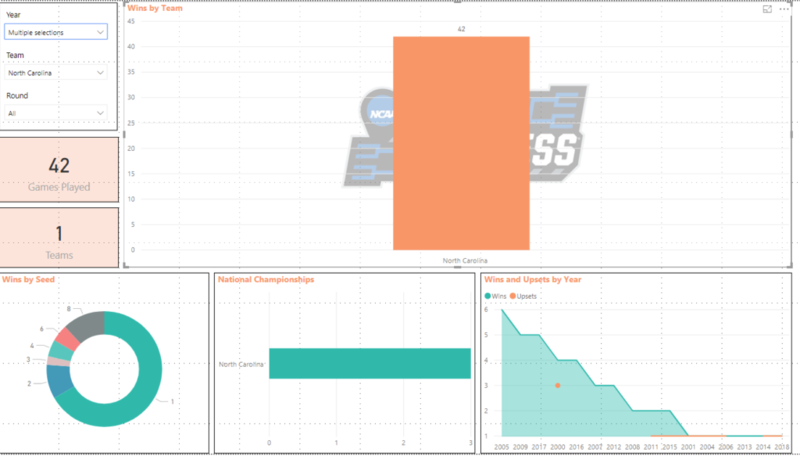 If you hover over the Wins and Upsets visualization, you’ll see there were 30 upsets out of 63 games. Let’s say I want to view data for a certain Team. Let’s choose Alabama Crimson Tide. If I change the Team slicer to Alabama I can see some data based around this team. 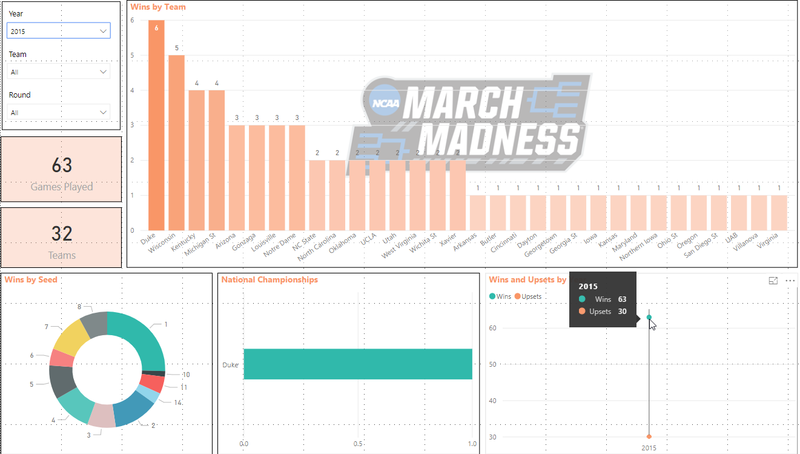 Alabama has won 19 NCAA tournament games, 0 national championships, has been a 5 or 7 seed 21% of the time and they’ve had a few upsets along the way. Not bad for a football school. 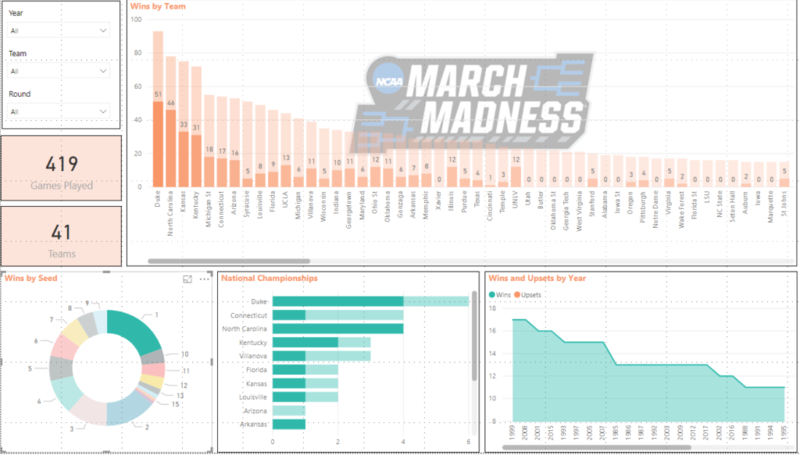 What about data for the National Championship game? I can change the Round slicer to 6, which is the National Championship round and view the data this way. I can see out of 34 games, there has only been 16 different teams make the National Championship. Duke leads the way with 6, followed by North Carolina and Connecticut with 4. The 1 seed has played in this game 59% of the time, and there were upsets in 1988, 1990, 1997, 2003, 2006, and 2016. We can see that the #1 seed has played in 419 games with a total of 41 different teams. Duke has won 51 games as the #1 seed while North Carolina has won 46. 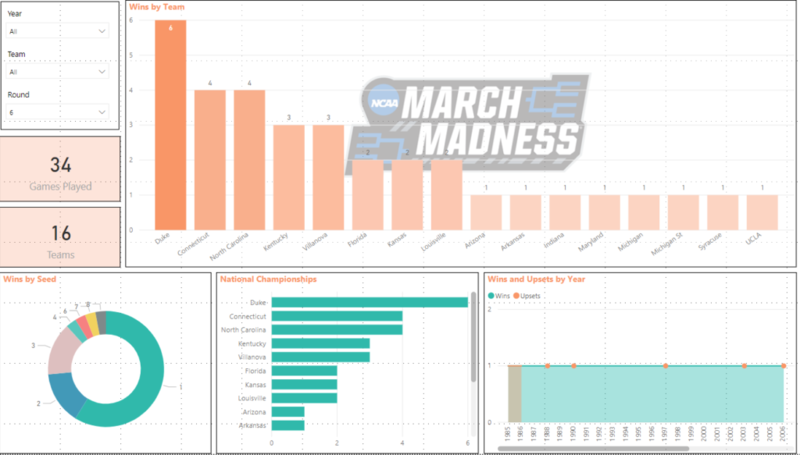 Duke has also won the National Championship 4 times as the #1 seed and in 1999 the #1 seed won 17 games which is the highest. Really cool stuff. I loved working on this project and working with this data. 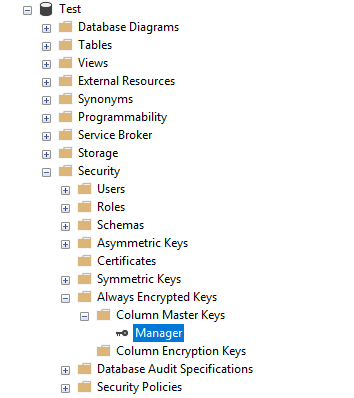 I ran into an issue where SQL Server was installed with the wrong collation and a lot of user databases were already attached. I could easily backup the databases, uninstall, reinstall, and restore the databases back, but this could take literally all day. There is a better and much faster way to make this change. This post will go over it…. Next, we’ll verify the current collation. 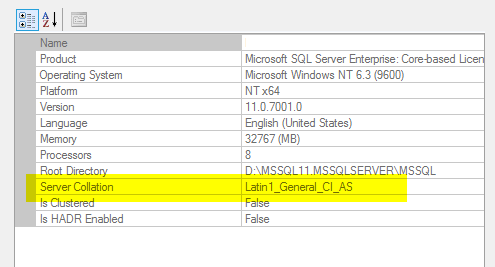 On this server it’s set to Latin1_General_CI_AS and I want to change it to SQL_Latin1_General_CP1_CI_AS. Open Command Prompt (as administrator) and browse to the BINN directory and type the following command. Before hitting Enter, let’s triple check and make sure those backups exist. 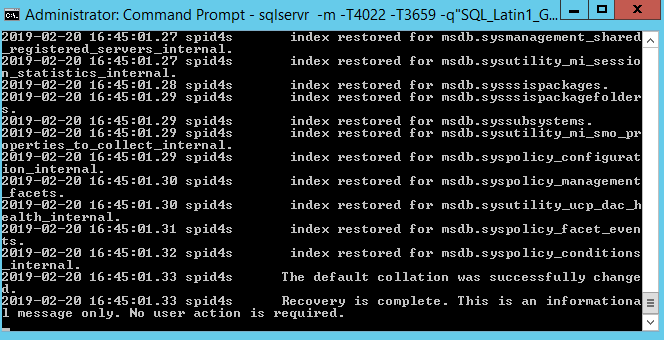 Close Command Prompt and start the SQL services back up. 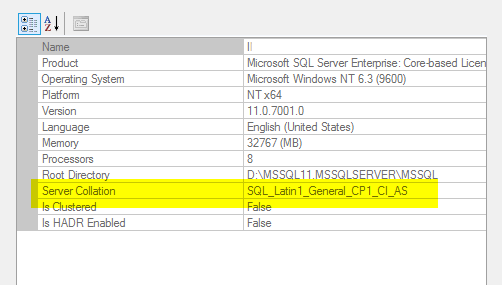 Back in SQL Server Management Studio, verify that the collation has changed.